THE LIMITED EDITION US $320. Yom Kippur – the Day of Atonement – is the holiest day in the Hebrew calendar and in Israel is marked by a national holiday but on that day in 1973 the unexpected happened. At 14.00 hours on 6 October the coalition of Arab states led by Egypt and Syria launched a surprise attack on Israeli positions. Thousands of Egyptian troops swarmed across the Suez Canal into Israeli- held Sinai whilst in the north nearly 1,500 Syrian tanks backed by artillery thrust west towards Israel. Facing this sudden surprise attack on the Golan Heights were less than 200 Israeli tanks. In the air, too, Egyptian and Syrian air forces struck in a single, co-ordinated assault hitting the Israeli’s anti-aircraft defences and hoping to deliver a fatal blow. 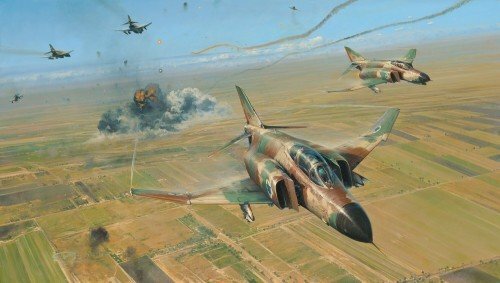 Robert Taylor’s powerful and dramatic painting depicts one such strike that took place on 14 October 1973 during the final stages of the war when Israeli F-4 Phantom fighter-bombers made simultaneous strikes against the Egyptian air bases at Mansoura and Tanta north of Cairo. After the first wave struck the elite Egyptian MiG-21 units at El Mansoura, the other Phantom squadrons attacked Tanta in waves, turning to dog-fighting immediately after dropping their ordnance. Tanta was also home to two squadrons of Libyan Mirage 5s and the ensuing air battle was so intense that at one point more than 180 fighter aircraft were involved. Despite bitter opposition, the successful IAF missions eliminated much of the effectiveness of the Eygptian Air Force and its Libyan allies. The Publisher is honored to present one of its most ambitious projects which has brought together no less than TWENTY TWO Israeli Phantom Pilots and Navigators who have autographed this unique edition, including some of the foremost Phantom Aces of all time.
. Brigadier General SHLOMO EGOZY – 10 victories, 2 in the Mirage and 8 in the F-4, Israel’s highest-scoring F-4 ace. Major General AVIHU BEN-NUN – 4 victories, 2 in the F-4 and 2 in the Mirage, became the Commanding Officer of the IAF between 1987-1992. Brigadier General YORAM AGMON – scored 6 victories, 4 in the Phantom and 2 in the Mirage, including the first ever Mirage kill. Colonel NAFTALI MAIMON – he scored 3 victories all in the Phantom. Brigadier General YOEL FELDSHO – 4 victories, 1 in the F-4 and 3 in the F-15, including the longest bombing mission ever staged in October 1985. Brigadier General SHAMUEL BEN-ROM – credited with at least 2 victories in the F-4. Brigadier General URI BAKAL – he was on one occasion forced to eject from his F-4 after suffering a direct hit. Brigadier General ZVI KANOR – he was credited with at least 1 victory in the Phantom. Colonel AMNON GURION – as a Pilot he was officially credited with 2 victories in the F-4 and spent time flying with Navigator ace ITZCHAK AMITAY. Major MEIR SHANI – scored at least 2 victories in the F-4 with Navigator ABRAHAM ASHAEL, before being shot down and taken POW. Colonel SHMUEL GORDON – he scored at least 1 victory while flying the Phantom before moving onto the F-16. Colonel DANI SHAKI – he shot down 3 MiGs in the F-4 on his first combat mission with AMIR NACHUMI. Lieutenant General DANI HALOTZ – scored 3 victories in the F-4, becoming the IAF Commanding Officer and later Army Chief of Staff. Brigadier General ITZCHAK AMITAY – scored 5 victories in the F-4 including 3 on a single day. Lieutenant Colonel YAIR DAVID – while flying the F-4 he was shot down but recovered in a daring Combat Search and Rescue mission. Brigadier General MOSHE BARTOV – credited with at least 1 victory flying the Phantom. Brigadier General ABRAHAM ASHAEL – scored at least 2 victories in the F-4 with Pilot MEIR SHANI before becoming a POW. Colonel YEHOAR GAL – scored 2 victories in the F-4, flying with Pilots EITAN PELED and DANI HALOTZ. Colonel ELI TOVEL – while flying the F-4 he ejected having been shot down but was later recovered. Lieutenant Colonel ACHIKAR EYAL – scored 1 victory in the F-4 which was the Phantom’s first aerial kill for the IAF.